Proud to announce The Wonderful Things Factory will be a contributing sponsor to The Sirena Alise Hurdle Clinic ! 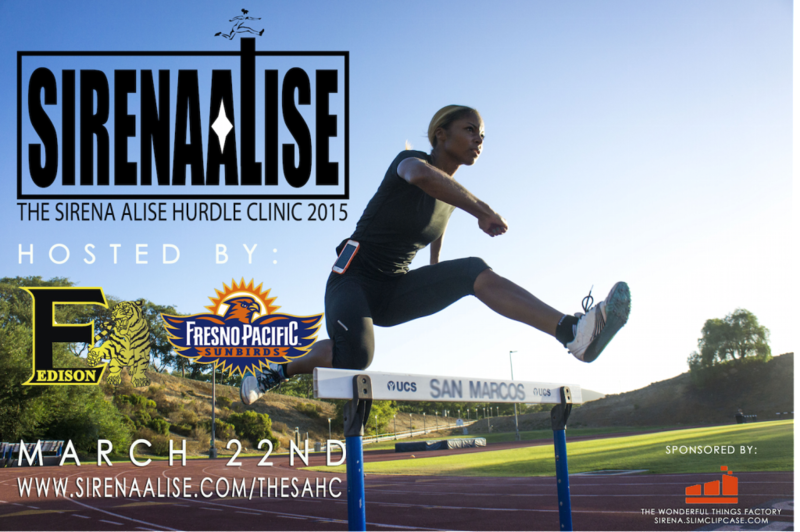 The Sirena Alise Hurdle Clinic (SAHC) is designed to teach youth the proper techniques of hurdling, both physical and mental. The Sirena Alise Hurdle Clinic teaches athletes proper warm up drills, speed and acceleration drills, proper hurdle technique, blocks starts and the mind set you should be in while executing drills and while hurdling. The SAHC hopes to inspire the youth in Sirena Alise’s home city, Fresno, CA, to get out and run. The hurdle clinic hopes to provide a weekend of fun and learning, that inspires the youth to pursue athletics as a means to stay active and live a healthy lifestyle. The SAHC looks to inspire those who may have considered hurdling and those who are current hurdlers to learn proper techniques from a professional of the craft. There is no better person to learn hurdle techniques from than a professional athlete. The SAHC will be hosted by Edison High and Fresno Pacific University Sunbird Athletics in Fresno, CA on March 22nd. For more information and details on how to register click the link below. The SAHC only has 50 spots available and space will fill up fast so register now to hold your spot and avoid missing out. Claim your spot now !